Welcome to Hot Rod Hideout in Pigeon Forge! 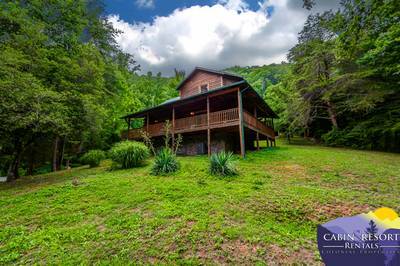 This 2 bedroom, 2 bath Smoky Mountain cabin rental offers you and your guests a fantastically convenient location near downtown and all of the area’s attractions. 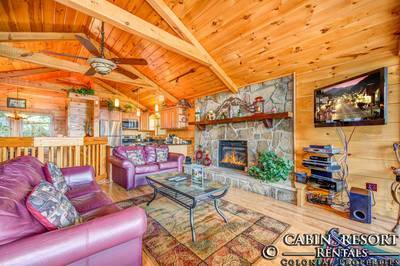 As soon as you enter this amazing Pigeon Forge cabin rental, you are greeted by the soothing natural wood accents and the inviting open floor plan. The super comfy living room features a mountain stone accented fireplace, flat screen TV, access to the covered front porch and comfortable seating. Adjoining the living area is the fully equipped kitchen that is the perfect place to prepare, cook and serve your favorite meals while on vacation in the Smoky Mountains. There’s also a nearby dining table that comfortably accommodates up to 4 people. 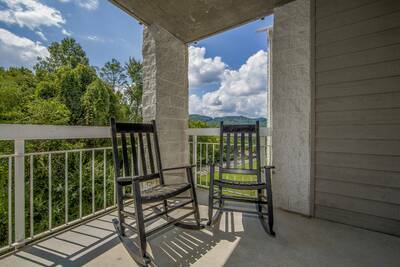 Step out onto the screened porch to enjoy the outdoors. This main level porch features a custom made bar area perfect for entertaining. 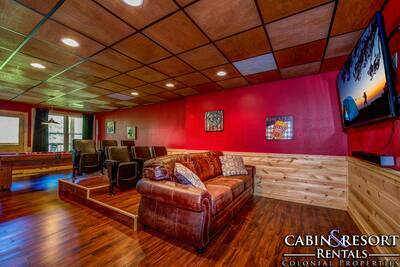 Located on the main level of Hot Rod Hideout is a cozy bedroom with a relaxing king bed and flat screen TV. There's also a full bathroom on the main level for added convenience. Venture downstairs and you’ll find the gaming area with outdoor deck access. Challenge your guests to a game of pool, relax on the futon, enjoy the stand-up arcade game or turn on the TV to watch your favorite shows. For additional convenience, the game room also features an adjoining full bath, twin/ full bunk bed, game table and mini fridge. This lower level is a great option for kids! For your convenience there is complimentary WiFi internet access so that you can browse the internet or check your email while you’re on vacation. In the warmer months, be sure to pack along your bathing suit and sunblock to go for a swim in the nearby swimming pool. If you’re searching for a wonderful vacation cabin to experience all of the wonderful things to see and do while on vacation in Smoky Mountains, Hot Rod Hideout in Pigeon Forge is the perfect place. 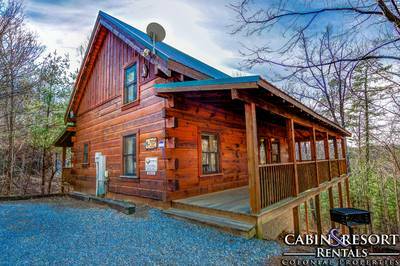 Just minutes from downtown in an easily accessible resort, this is the perfect family vacation cabin. Contact us today to plan your adventure to the Smokies! A: Hey Lori, approximately 15-20 minutes! A: Hi Sandra! Hide Rod Hideout is not a pet friendly property. However, we do have properties on our program that are. A: Hi Jackie! Hot Rod Hideout is located within Arrowhead Resort. A: Hi Jerry! 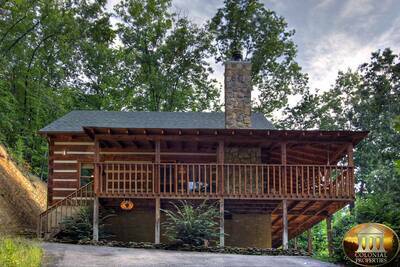 Hot Ride Hideout is located in a cabin subdivision and is viewable by other homes. A: Hi Dustin! Hot Rod Hideout is approximately 12-15 minutes to Dolly Parton's Stampede. A: Hi Melissa! Yes there is a bedroom on the main floor. “ Everything was great, the place the view everything. “ Loved it will definitely be coming back soon! “ Enjoyed every moment at the cabin , quiet and peaceful, will plan to come back. “ The cabin was cozy and inviting. Close to town and easy to find. The area the cabin is in was quite and rather pretty. You wouldn't know that you had other cabins around you. The staff was friendly and professional, a pleasure to do business with. “ Everything was nice! It was cozy and family friendly! “ We had a wonderful Time.